Who Will Win The Match Today of MI vs RR 27th Match Indian Premier League 2019? Can Rajasthan Royals register their second win against Mumbai Indians? Mumbai Indians are all set to take on Rajasthan Royals on Saturday, April 13, 2019, at Wankhede Stadium, Mumbai. Read the complete post to find out who will win today. 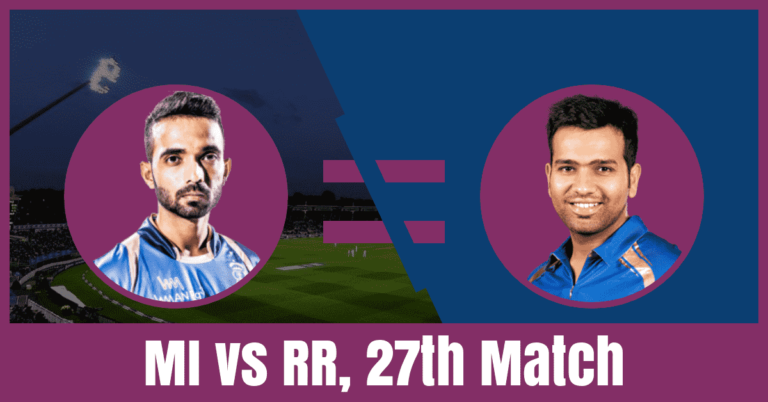 In today’s Mumbai Indians (MI) vs Rajasthan Royals (RR) Dream11 Prediction we have covered predicted playing 11 of RR vs MI, pitch report of Wankhede Stadium, Mumbai, weather report of Mumbai, the best choice of captain and vice-captain, players recent and past performance, players injury updates. If we are looking for Mumbai vs Rajasthan full squad, MI vs RR latest news, who will win today, toss prediction, astrology prediction, Dream 11 free grand league team then you are at the right place. All the above information, data and statistics are accurate and taken from very reliable sources. Make sure to read the post completely so that your winning chance increases to 100%. 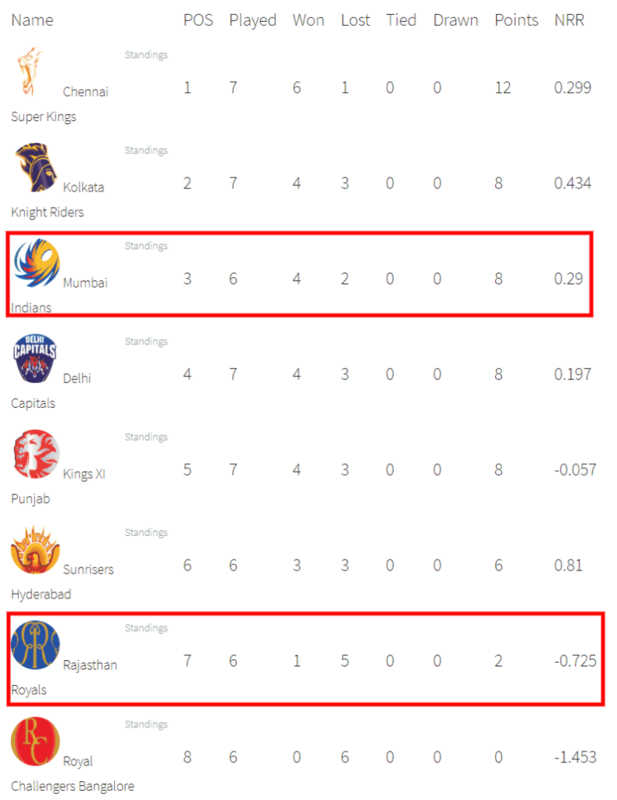 Mumbai Indians are in the third position of the points table with eight points in their pocket. Mumbai Indians have played 6 matches, won 4 and lost three matches. They have won their last match against KXIP by 3 wickets. Prior to that, they have won against SRH by 40 runs and won against CSK by 37 runs. They have won their last three matches back to back. Kieron Pollard, Quinton de Kock, Suryakumar Yadav, Hardik Pandya and Rohit Sharma are the top scorers of Mumbai. They have scored 179, 157, 138, 121 and 118 runs. Hardik Pandya, Jasprit Bumrah and Alzarri Joseph are the top wicket-takers. They have taken 6 wickets each. On the other hand, Rajasthan Royals had a poor start in this Indian Premier League. They are in the seventh position of the points table with two points in their pocket. They have played 7 matches, lost 6 and won only one game. Jos Buttler, Steven Smith, Sanju Samson, Ajinkya Rahane and Ben Stokes are the top scorers of Royals team. They have scored 199, 174, 146, 138 and 104 runs. Shreyas Gopal, Ben Stokes and Jofra Archer are the top wicket-takers. They have taken 8, 6 and 4 wickets. Kieron Pollard, Quinton de Kock, Suryakumar Yadav, Hardik Pandya, Rohit Sharma, Jasprit Bumrah and Alzarri Joseph are the key players of Mumbai Indians. Rohit Sharma is fit to play today and he will lead the MI team. He will replace Siddhesh Lad. Quinton de Kock, Suryakumar Yadav and Rohit Sharma will lead the batting department. Alzarri Joseph, Jasprit Bumrah and Jason Behrendorff will lead the bowling department. Kieron Pollard and Rohit Sharma are the most valuable players of Mumbai Indians. Batsmen: Rohit Sharma, Suryakumar Yadav, Ishan Kishan, Kieron Pollard. All-Rounders: Krunal Pandya, Hardik Pandya. Bowlers: Jasprit Bumrah, Alzarri Joseph, Jason Behrendorff, Rahul Chahar. Rohit Sharma(c), Evin Lewis, Quinton de Kock(w), Ben Cutting, Suryakumar Yadav, Mitchell McClenaghan, Ishan Kishan, Anmolpreet Singh, Jayant Yadav, Kieron Pollard, Anukul Roy, Hardik Pandya, Mayank Markande, Krunal Pandya, Barinder Sran, Alzarri Joseph, Yuvraj Singh, Rahul Chahar, Aditya Tare, Jason Behrendorff, Siddhesh Lad, Jasprit Bumrah, Lasith Malinga, Pankaj Jaiswal, Rasikh Salam. Jos Buttler, Steven Smith, Sanju Samson, Ajinkya Rahane, Ben Stokes, Shreyas Gopal and Jofra Archer are the key players of Rajasthan Royals Team. Ashton Turner and K Gowtham may get a chance in place of Steven Smith and Riyan Parag. Ben Stokes will playa s a key all-rounder. Dhawal Kulkarni, Shreyas Gopal and Jofra Archer will lead the bowling department. Jos Buttler and Ben Stokes are the most valuable players of the Royals team. Batsmen: Ajinkya Rahane, Sanju Samson, Rahul Tripathi, Steve Smith/Ashton Turner. All-Rounders: K Gowtham/Riyan Parag, Ben Stokes. Bowlers: Dhawal Kulkarni, Shreyas Gopal, Jaydev Unadkat, Jofra Archer. Ajinkya Rahane(c), Ish Sodhi, Jos Buttler, Shashank Singh, Sanju Samson(w), Shubham Ranjane, Steven Smith, Aryaman Birla, Rahul Tripathi, Stuart Binny, Ben Stokes, Ashton Turner, Riyan Parag, Mahipal Lomror, Jofra Archer, Liam Livingstone, Shreyas Gopal, Prashant Chopra, Jaydev Unadkat, Krishnappa Gowtham, Dhawal Kulkarni, Varun Aaron, Sudhesan Midhun, Manan Vohra, Oshane Thomas. The pitch of Wankhede Stadium, Mumbai will be batting friendly. However, the fast bowlers may get some purchase in the initial couple of overs. According to Crix11 astrology cricket match prediction, Mumbai Indians will win the match today. Mumbai Indians will win the toss and opt to field first. This is what our astrology department predicts. You may like to read all dream11 prediction.